The PM update for today starts with the trailer for a new documentary called \’Changing Tides\’. Focusing on the major issue of plastic waste in the oceans, the 15-minute documentary has the backing of top windsurfers such as Levi Siver. Maui is one of the first locations to see the massive affects of the world\’s floating garbage and the locals are keen to share the story and promote awareness. Head to sustainablemaui.org to find out more about the project which every windsurfer can get behind. As reported in the headlines yesterday, the weekend UKWA Freestyle event at Worthing didn\’t see a result. The BSA Slalom fleet were able to complete some competition however, with Simon Cofield taking the win over Ant Baker and Paul Simmons. UK rider Mike Archer has posted a short report with some cool photos from the south coast on his blog here. 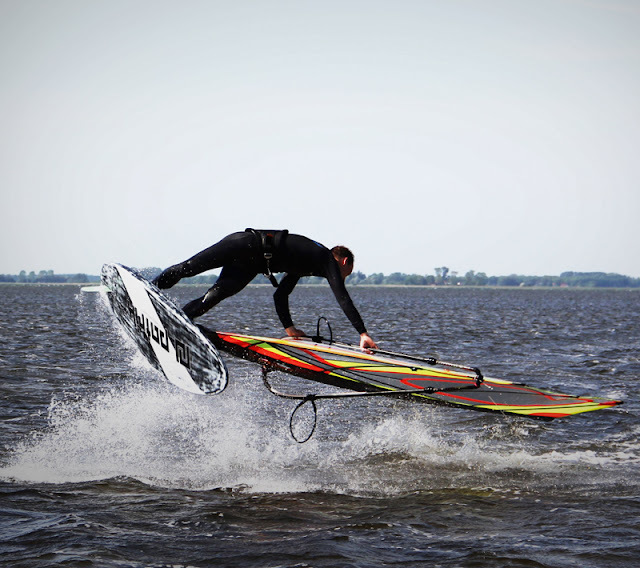 German freestyle/wave ripper Mathias Genkel has posted a report from the weekend. Beating the crowds at his local spot, Mathias headed off to explore a new spot and was rewarded with some mirror flat waters and strong wind. Check out a selection of sick shots over on his blog here. The Columbia Gorge Windsurfing Association is happy to announce the Gorge Windfest Weekend has been confirmed for July 7th/8th. With free demo gear available for everyone to try, free clinics from local pros, free beginner sessions, live music and beer, it promises to be an epic weekend on the Columbia River. Head here to find out more details about the event. AHD and Hot Sails Maui rider Diony Gaudagnino has claimed victory at the ONA Cup Slalom Pro on Margarita in Venezuela. Speeding ahead of local friends Ricardo Campello and Gollito Estredo, Diony took first place in strong conditions. The event was sponsored by the National Anti Drug organisation and is a great example of the positive side of watersports in the area. Read Diony\’s report here.